Clichés are often true and it is the case that a picture can be worth a thousand words. 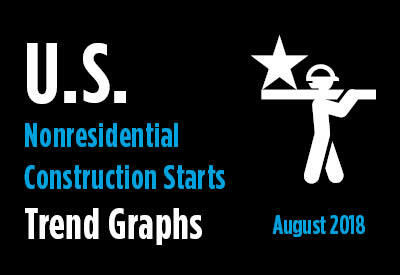 Below are six graphs recording 12-month moving averages of ConstructConnect ’s nonresidential construction starts. When the value of the current month is higher than for the same month a year ago, the line will turn up; when lower, it will dip. String a couple of similar positive or negative directional changes together over several months and one has a trend. And that’s what the graphs are designed to do, show improving or deteriorating trends in a dozen major and more granular categories of construction work. Click here for the Top 10 Project Starts in the U.S. – August 2018.